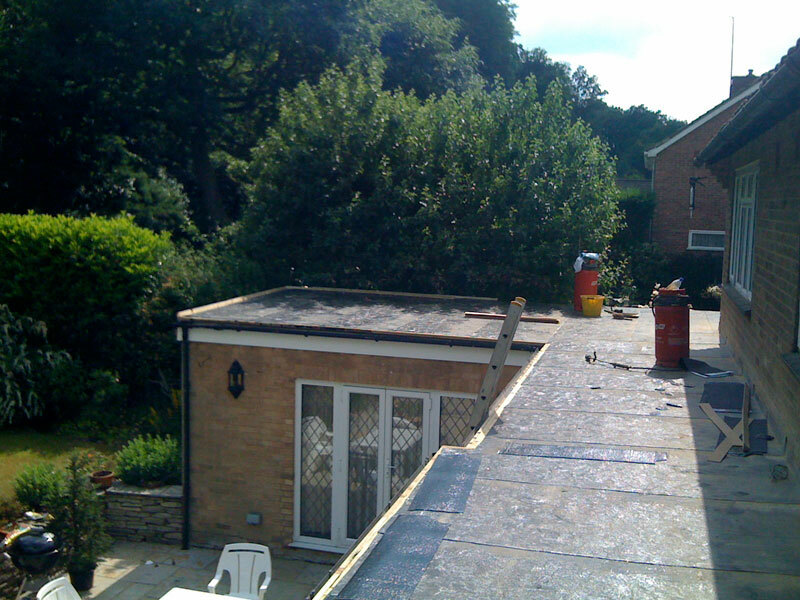 New built-up felt roof covering to a rear addition. 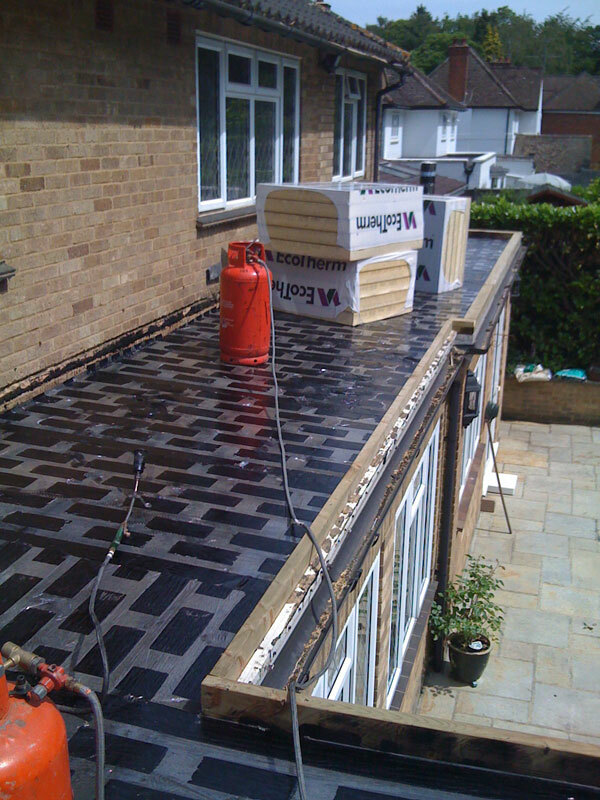 The work included replacing the supporting decking, installing insulation with the roof covering and a new standard 3 layer built-up felt roof covering. 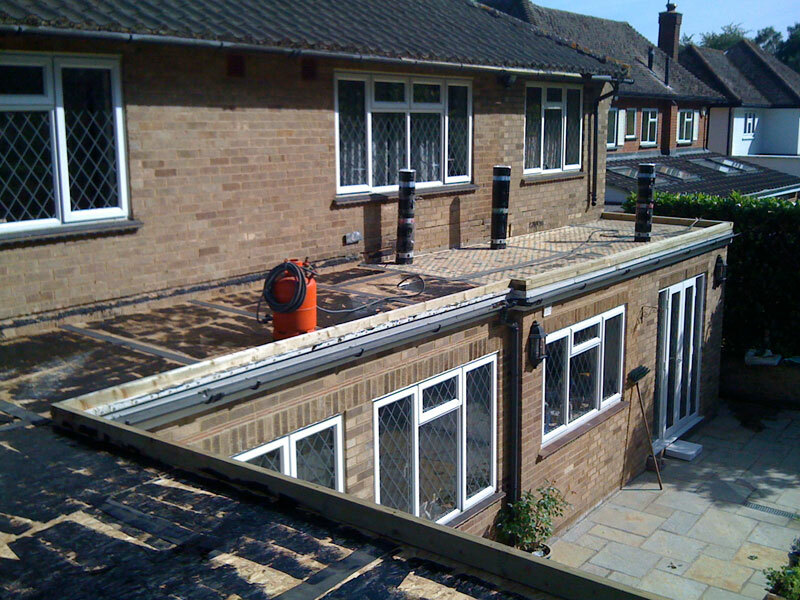 When replacing any roof covering, the work must include upgrading the insulation within the roof to meet requirements set out in the Building Regulation Part Lb. To comply with this we recommend that clients install a Warm Roof specification with insulation installed above the timber decking and within the weatherproofing system. This work is relatively costly so we also recommend to the client that specification should attract a manufacturers insurance backed guarantee with a term of 15 years. 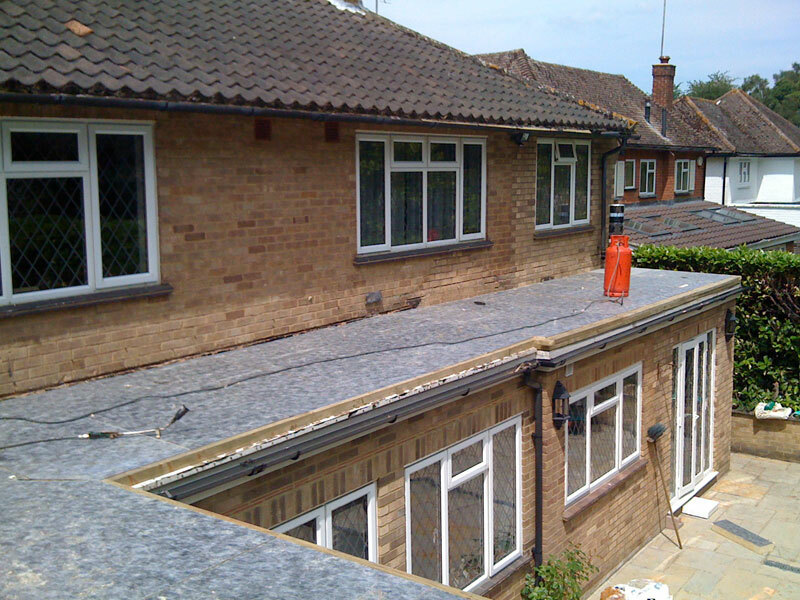 This new flat roof covering has a life expectancy of more than 35 years. 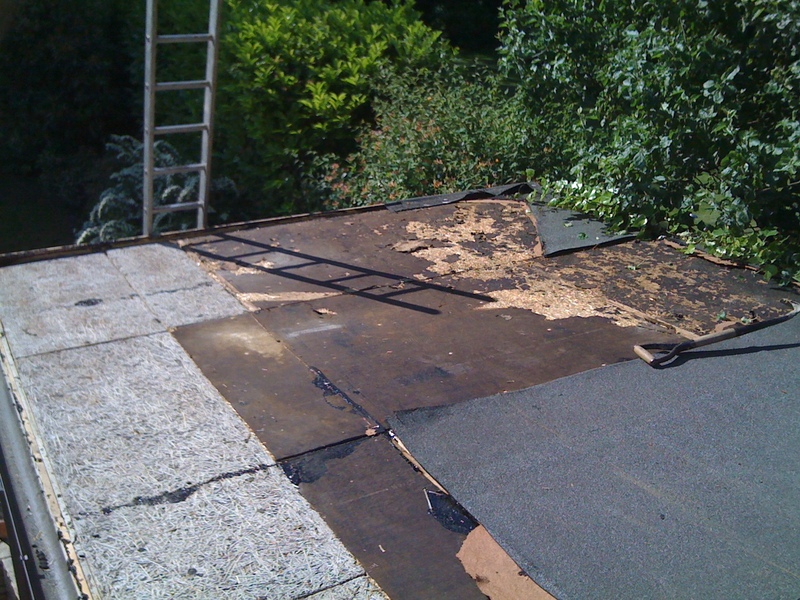 The first job was to strip the existing roof. 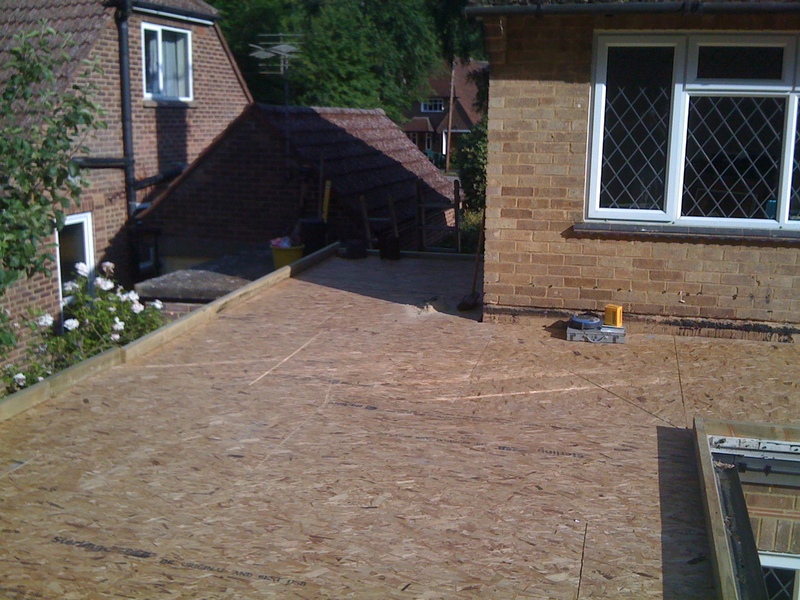 At the time we knew that the existing deck was a straw based material and also needed to be replaced. The join between the boards needed to be covered and a primer applied to the new decking to help with adhesion. 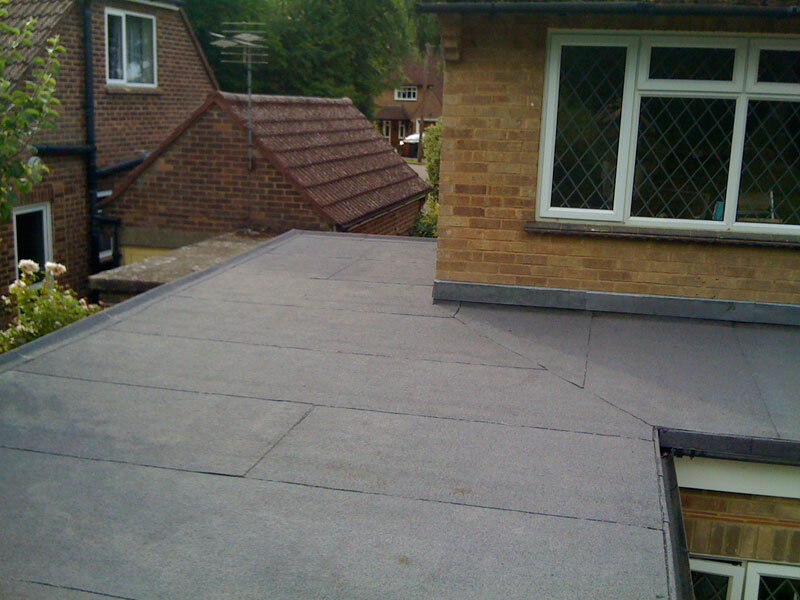 A Vapour Barrier was installed and fully bonded to the timber decking. Using the propane torch gun, the bitumen underside of the felt was melted, which adhered to the primed decking. To comply with Building Regulation Part L insulation was installed. This insulation was specifically designed to be stuck using the propane torch gun to the Vapour Barrier. The next layer can then be stuck directly to the insulation. A weatherproofing underlay was then stuck to the insulation. The roof at this point is completely watertight. As the roof is now 100mm higher the gutter had to be adjusted accordingly. In such an instance the fascia boards were replaced and the existing gutter was re-used , having been adjusted to the height of the new roof. The finished roof. A lead flashing has been installed to complete the weathering detail to the main house brickwork. The finished roof. 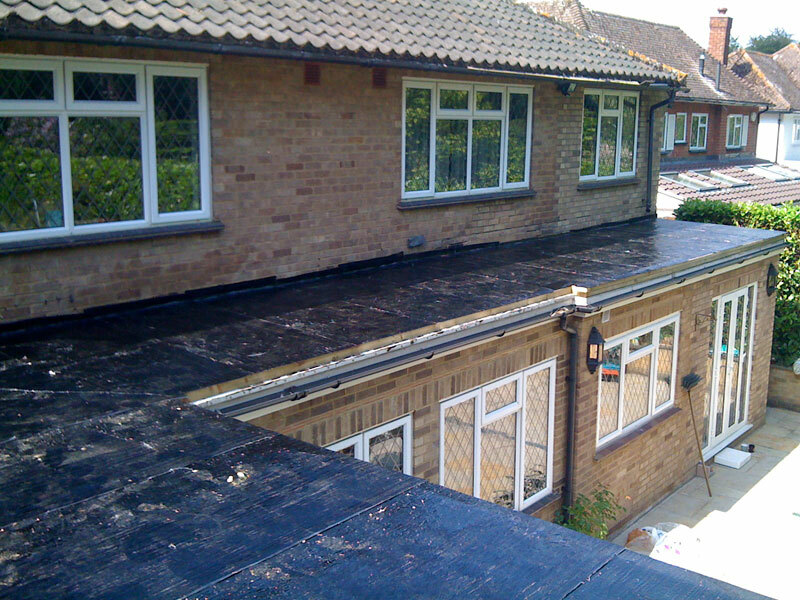 A mineral capsheet has been applied to finish weatherproofing the flat roof. Capsheet was used in various ways. One of which was to construct a detail called a welted drip to transfer rainwater from the roof into the gutter. All the layers of felt have been staggered which makes the roof strong and watertight.